Dota Theme Manager Christmas Edition (DTM XMAS) Released! Wow, Infrisios really spoiled us. After release the Dota Theme Manager 3 just a while ago, now he's releasing Dota Theme Manager Christmas. Way to go! Well, i haven't try it yet, so i cannot post some picture right now. But i believe that Infrisios never let us down with his masterpieces. here's a mirror for the file.. It's just snow terrain with little things on the trees. 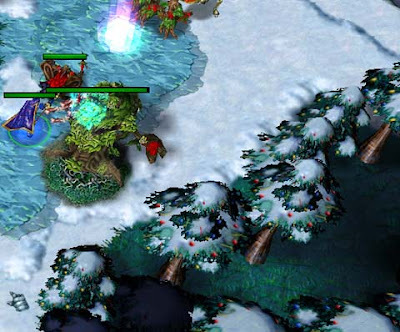 yeah its just a snow terrain with those little decorations on the trees.. but still it's good..
im looking forward for the next version that roshan has a santa hat..
then -music nightelf1(to play jingle bells)and maybe -water green. do xmas theme works on 6.77?